Amazing Cuba has become a cruising hotspot - a result directly attributed to the restoration of U.S diplomatic relations with the Island Country in 2015. Airlines were granted access to fly into Cuba, and cruise ships have added the capital Havana as a regular stopover. Meanwhile Airbnb have made huge inroads as tourists began flocking to the former U.S sanctioned country. Eager travellers have been keen to see more of the country "frozen in time" before the easing of trade restrictions starts to change the landscape. Spending on average 10-15 days in the country Australian & Kiwi travellers are looking for the latest Instagrammable destinations and Cuba is high on the priority list. The distance from down under is a bit of a factor, however combining your Cruise to Cuba with a Holiday in the U.S or Mexico, makes a viable and realistic option. Entering Cuba is like entering a land frozen in time. If you've flown into the country previously, chances are you've arrived on Cubana Airlines and one of their smoked out planes - completely safe of course, just a tad of humidity upon takeoff! Arriving in Cuba's capital Havana you'll be left wowed by the 1950's feel of the place. Thousands of 1940's and 50s vintage American cars rumble up and down city streets like it's just another day. It's "Back to the Future" all over again - no this is not a classic car show! A walk through Old Havana and you'll be immersed in the flavour that is Cuba - from quaint little cigar bars, jazz and salsa clubs, it really is a place like no other. Cuba is a Carribean Island nation situated south of Miami, Florida and East of Mexico. The Island sits amongst neighbours such as the Bahamas, Jamaica, Dominican Republic and Puerto Rico. The capital Havana, is a mere 1.25 hour flight from both Miami (USA) and Cancun (Mexico). The Cuban climate is best from December to April when it’s dry and sunny. Between June and October you can expect to see a few tropical rain showers. Cruisers should be aware of the Hurricane Season from July to mid-November, however this should not deter you from planning your cruise to the region as dire situations are rare. In any case, please ensure you are adequately covered with comprehensive Travel Insurance. Havana is approximately 14 hours behind AEST (depending on daylight savings time. Cuba operates two currencies - a currency for the locals and another for the tourists. Both are legal tender. When exchanging money in Cuba, you'll receive the Cuban convertible Peso (CUC) which is equal to $1 US Dollar. Cuba Cruises disembark in Havana at Terminal Sierra Maestra. The terminal is a short distance from the Old Town Square. Holland America has of number of cruises to Cuba from Fort Lauderdale and Boston which may have you docking in Cozumel (Mexico), Grand Cayman, Belize, or George Town. Cuban Explorer Cruises from Boston are usually around 14 nights whereas a Fort Lauderdale option could have you sailing for between 7 and 12 nights depending on the number of ports. Royal Caribbean have mainly short Cuba cruises from Forida (Miami and Tampa) on 4, 5, 6 and 7 night round trips. Stops may include Key West and Cozumel along the way. MSC has a variety of cruises to Havana departing from Mexico (Cozumel) on 7 night voyages, stopping in ports such as Georgetown (Cayman Islands), Montego Bay (Jamaica), Belize, and Roatan (Honduras). Norwegian cruises from Orlando on Cuban itineraries through the Caribbean. 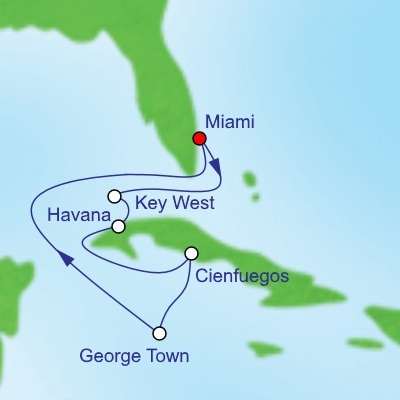 These convenient 4 night cruises port in Key West, and Havana before sailing back to Orlando. Stroll through Old Havana soaking in the atmosphere, history and architecture. Take a History lesson at the Museum of the Revolution and El Capitolio. Sip on a Mojito in a Cuban bar taking in the sights and sounds. Dine on some spiced Cuban cuisine.